When considering how to enter the China market, or starting a business in China as a foreigner, it is important to get someone who can help in navigating through the market. Although this does not give a guarantee that the sailing will be smooth but at least it will help you avoid many pitfalls that may be present in the way of establishing a business. When you are considering how to do business in China you need a partner. The guide or partner should be a Chinese local company or local partner. The partner will help you learn on how to do business in China and be competitive. Fung, Yu & Co CPA Limited can be just that partner for you. Before deciding on doing business in China, it is important to find a good strategy on how to enter the market, one that will best suit a new business in China. It is important to first identify the market. Different businesses have different markets depending on the locations. One should first identify the market and their location. There are some of the locations that are usually appropriate for certain business setups. For example, Shanghai is well known to be a great place to start chemical, petrochemical, automobile, pharmaceutical, financial and electronic apparatus companies. There are certain cities such as Zhejiang, Shanghai and Guangdong that are known to be good cities to start-up a business because of their high population. It is also important to identify the government regulations when formulating a market entry strategy. The regulations and legislations are usually important factors that affect the timeline and cost of market entry. One should then follow due diligence, hire staff, conduct market research and find strategies for protecting Intellectual Property rights in the country. There are rumours different ways in which foreign firms may start a business in China. The country now allows foreign companies to venture into the market as Wholly Foreign Owned Enterprise (WFOE), Representative Office, Joint Venture and Foreign Invested Partnership Enterprise, a relatively new option. 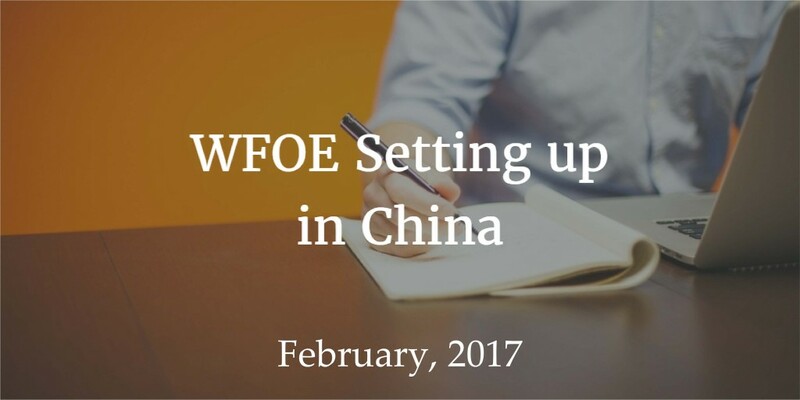 Wholly Foreign Owned Enterprise, also abbreviated as WOFE is a limited company based in China and owned by a foreign investor. The government limits the investment that the foreign investors put into the firm when setting it up. The wholly owned foreign enterprise is different from other foreign business set-ups such as joint venture in that the foreign investors control and invest into the business without any influence from the Chinese government, except for the government regulations such as corporate registration and taxation. Wholly owned foreign enterprise is permitted to operate in the country like any other company, invoicing the consumers and earning profits unlike for setups such as a representative office. The company can also carry out its operations using the Chinese currency and therefore the costs and invoices are tax deductible for the WOFE. The companies can also hire as many foreign staff as they may see fit provided they are compliant with the country’s rules governing foreign workers. The greater the company, the more foreign workers it can employ. The company can also hire local staff if they are willing. Before registering a company in China, foreign investors should first choose a business name that will be given to the firm. The company name for the WFOE should be in Chinese. According to the business naming regulation in Chinese, the first word in the business name should be a company name, the second word should be the activity the business would undertake, the third word should be the location of the business and the fourth word should be the company structure. After selecting the appropriate name to call the business, it is then registered with the State Administrative Bureau for Industry and Commerce (SAIC), this is the China company registry. If a company is to use the name ‘International’ or ‘China’ in their Chinese business name, they should have a minimum capital of 10 million USD. A country should pre-register a name with SAIC with five to eight alternative names before they undergo any applications. The SAIC will then decide whether a name is appropriate or not. Company registration in China is usually different to that of other nations. The Chinese regulations usually discourage foreign investors from submitting their application documents for their start-up business directly to the relevant authority in China. This is especially true for the foreign investors starting up WFOE in China. For the investors to submit their relevant documents, they usually have to find a public representative within China, an entity that is authorised by the authorities to present such document and act as a sponsor. This entity submits the documents for scrutiny and approval by the State Administration for Industry and Commerce. Registering an appropriate business name with the State Administration of Industry and Commerce. Certificate of approval by foreign economic cooperation bureau or ministry of commerce. Application for a business license with the State Administration of Industry and Commerce. Registering and being approved by the State Administration of Foreign Exchange. Before starting a company registration in China when you are only considering venturing into the Chinese market, foreign investors at times open representative office, which are liaisons to the parent company. An investor may do this to first test the Chinese market before setting up a WFOE. However, the representative office is usually restricted to conducting businesses that do not have profits. After the test, the foreign investor can then shut down the representative office and set up a WFOE.